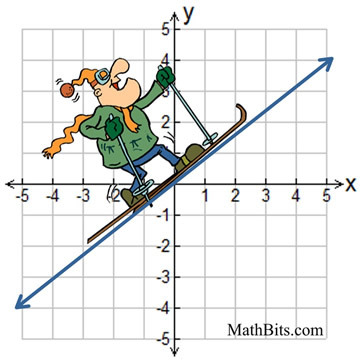 While slope is used to describe the measurement of steepness of a straight line, it can also be used to describe the cross-country ski slopes that Oscar likes to frequent. 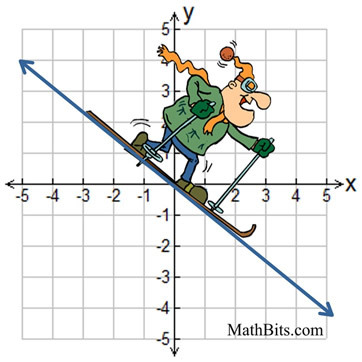 Below is a break-down of the types of slopes that Oscar encounters on his cross-country graphing adventures. from left to right, have a positive slope. Such "hills" require Oscar to increase his energy level to get up these hills. to get up the hill. "up-hill", from left to right, have positive slope. from left to right, have a negative slope. Such "hills" require that Oscar decrease his energy level in an attempt to slow down. "down-hill", from left to right, have negative slope. or decrease, his energy level. The change in his energy level is zero. Horizontal lines have lots of "run", but no "rise". Therefore, rise/run = 0/number = 0. Lines that are vertical (straight up and down) have no slope (or undefined slope). 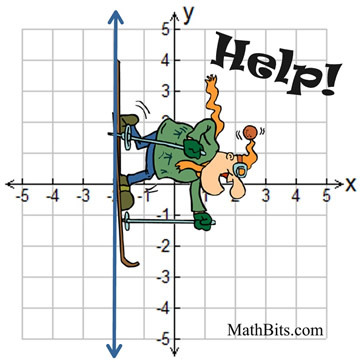 This means the slope does not exist. 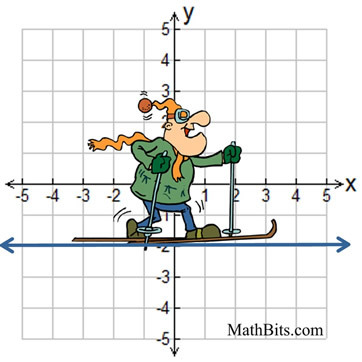 It does not mean the slope is zero. Oscar cannot ski on such "paths". Broken bones await him at the bottom. Vertical lines have lots of "rise", but no "run". Therefore, rise/run = number/0 = undefined.